The mortality rate in Kyrat must be absurdly high. We've already met Far Cry 4's antagonist, the bewilderingly purple-suited Pagan Min and his shockingly gaudy hair, but what is really going on in Kyrat? 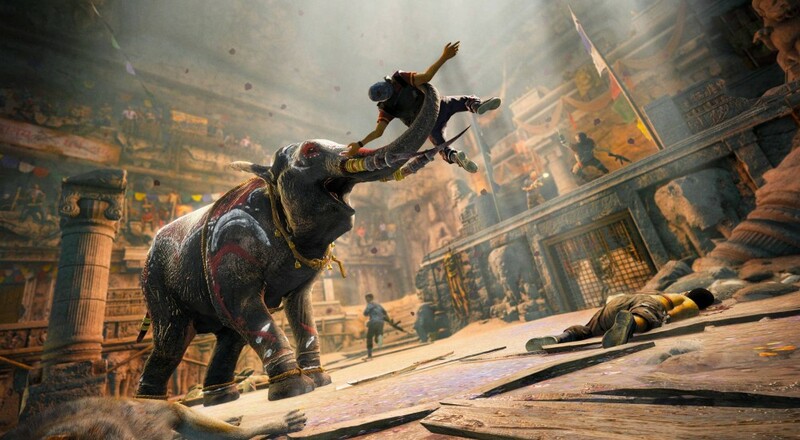 With FC4 launching in just under two weeks now, we're gonna need some context for why we're knifing militants and sicking elephants on jeeps. Ubisoft has kindly provided a story trailer which doesn't really show that much story, but at least lets us know a little bit more about the universe. On top of Pagan Min's forces, looks like two factions are warring to wrest control of Kyrat. Protagonist Ajay is probably going to have to side with one and obliterate/shank the other in order to bring stability to the war-torn nation. And on top of murdering a trillion people, Ajay still has to find time to spread his mother's ashes. What would a modern day triple A game be without a Season Pass, 'eh? The Syringe drops launch day only for Season Pass holders. This co-op piece of DLC involves you and a buddy stumbling across a recipe for a gnarly biological weapon, and subsequently making sure Min's forces don't get their tyrannical mitts on it. Escape from Durgesh Prison puts you and your co-op pal in a less-than-comfy prison, which you must bust out of, then survive in the harsh wilderness. The Hurk Deluxe Pack comes with five missions and a special gun used by Hurk in the main game. Overrun is an extra PvP mode similar to a "capture and hold" style of play, if you're into that kind of thing. Valley of the Yetis puts Ajay in a frosty ridge line, accompanied by a bit more than Ghurka soldiers. The Season Pass retails at $29.99, offering a 20% discount from buying everything piecemeal. The "Gold Edition" of Far Cry 4 goes for $89.99 and comes with the Season Pass enabled already. The "Gold Edition" is currently available for pre-purchase on PC and PS4, and is due soon to the Xbox One.